I acquired most of my BTC gear through eBay (only a couple of Hashbusters directly from Ukraine and a Single while BFL had them on sale). They cost a premium there, but it was fun playing around with the variety of gear. I have resold most of the things by now and received a note about strange power usage from Simply Energy. I wanted to save myself some trouble and get an LTC rig off eBay, but the prices seem not worthwhile. The description of the rig is generic, almost like a pre-order, the seller is offering to build it for you assuming you cannot handle motherboards and pci-riser cards. 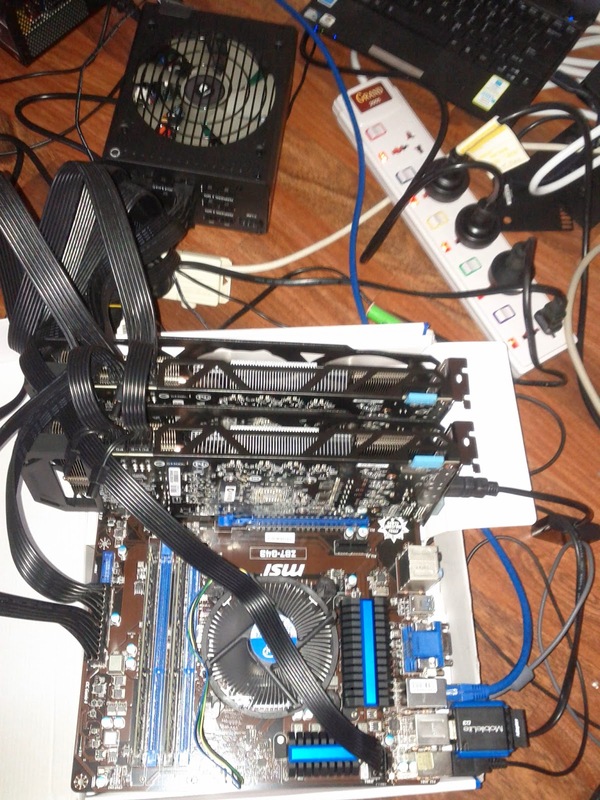 So I decided to have a go and thanks to the numerous guides and forum posts, setting up a rig with 2 GigaByte AMD 270x cards was a breeze (opencl calls them pitcairn). 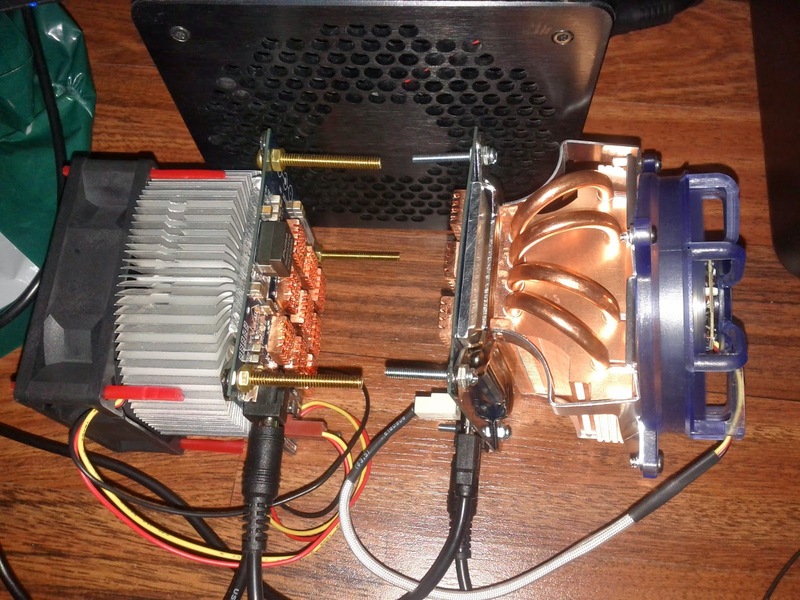 The 270x's are power hungry, taking about 200W each, you will need at least a 600W PSU with 2 cards to keep up. Get a modular PSU and will come in really handy in keeping all the cables neat and tidy and switching to powered PCI-e riser cards. I was planning to build a 4+ cards unit, so I got the Corsair RM1000 PSU. Next was the choice of a Motherboard, it ended up getting the MSI Z87-43 with 2 x16 slots and 2 x1 slots usable with risers. In retrospect the Z87-45 would have been a better choice since it can handle more PCI cards or the made for BTC ASRock H81 pro BTC. After that there are behemoths such as the Trenton PCI host board with 18slots. Getting the AMD Catalyst Drivers installed on Linux is a major pain. Finding the right patch requires some searching, but in the end it works quite nicely. After getting 1 machine working I imaged the SD card using win32diskimager and set up other motherboards I had lying around to run the same config. 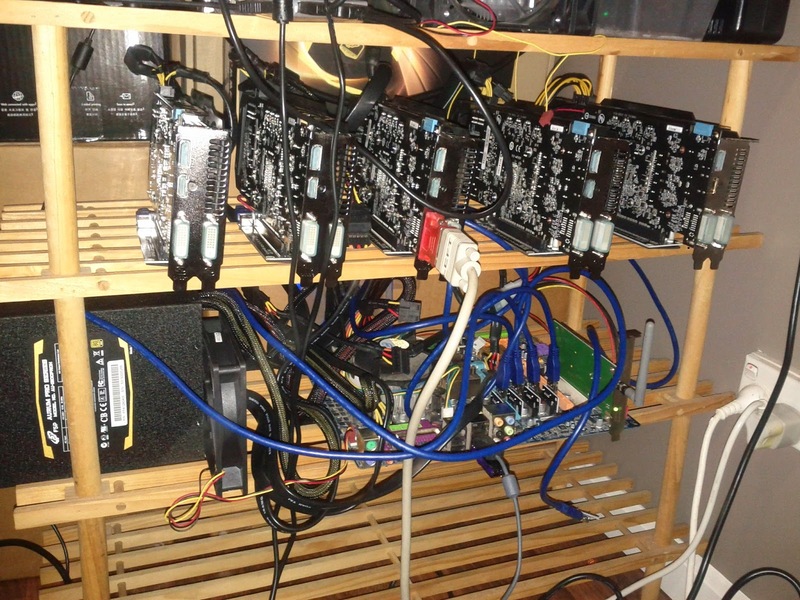 Just as I got going I realized that with the advent of ASIC's the supposedly ASIC resistant scrypt mining is now beyond GPU's time to look into vertcoin or dedicate these to Folding@Home. Meanwhile if you are still playing with Scrypt based altcoins check out wafflepool and my Android widget to keep tabs on it.